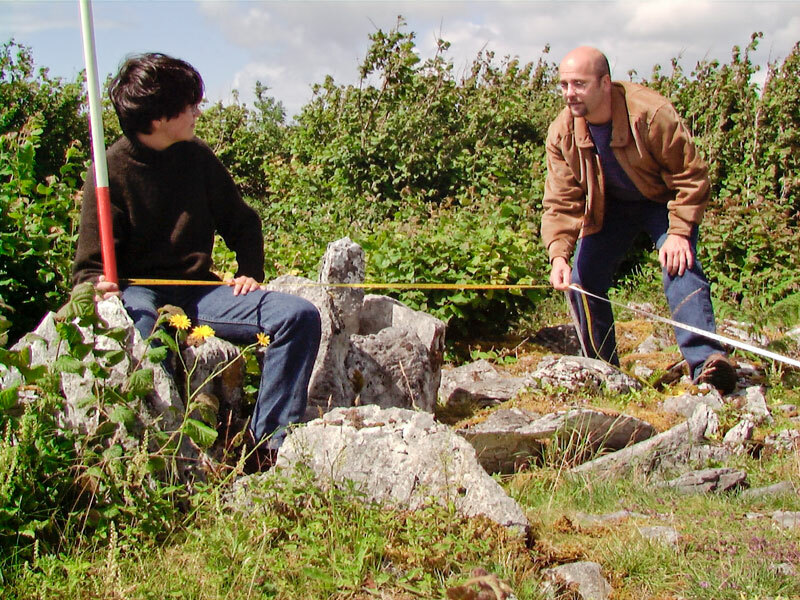 Drag to view this timeline of Irish archaeology. 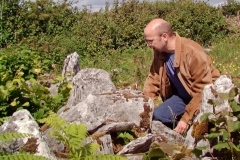 As one of the many modern-day inheritors of the zeal exhibited by John O’Donovan’s antiquarians, NUI Galway archaeologist Carleton Jones is shown in photographs and video clips on this page investigating a Neolithic tomb on the Burren in Co. Clare. 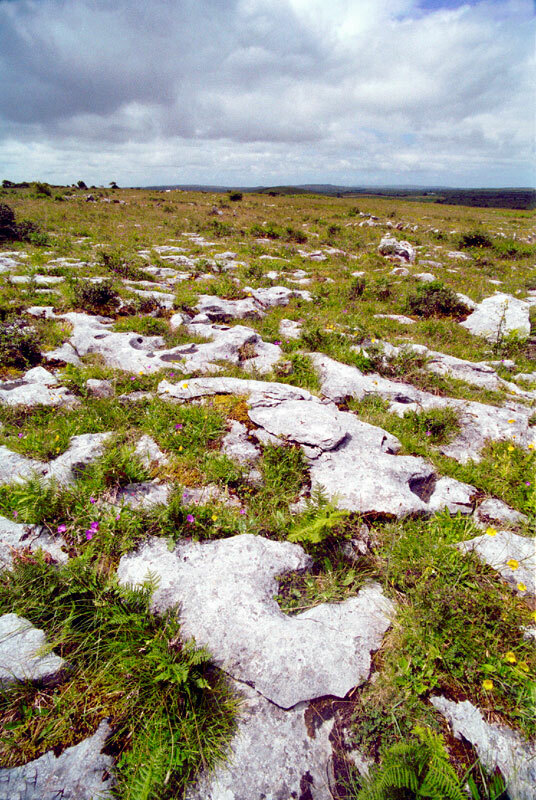 The sites he studied are located near the Parknabinnia Wedge Tomb. 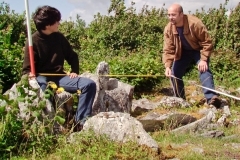 Professor Jones’ 2007 guidebook Temples of Stone: Exploring the Megalithic Tombs of Ireland is an engaging and approachable introduction to the monuments, as well as a useful field guide for the visitor to Ireland. It is cited in several places in the essay that follows. We were fortunate to spend some time with Dr. Jones in 1998 and 1999 documenting some of his work on the Burren. 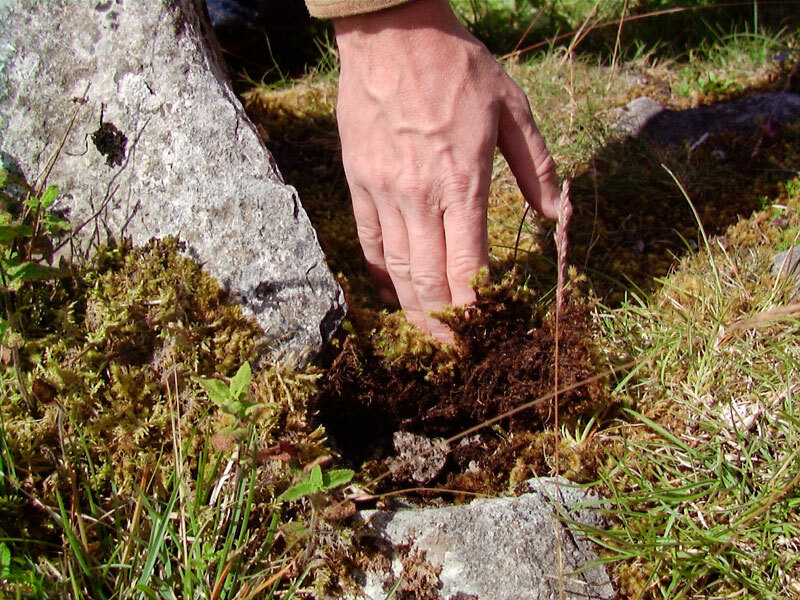 The ancient stones of Ireland are exquisite objects in their own right, even disassociated from their ritual and prehistoric context or any accumulated folklore. Coated with moss and lichen of many earth-warm colors, weather-etched as witnesses to the passing ages, and carved by geologic forces into shapes eloquently sculpted, they have a surface richness that is a fitting setting for the magical meanings that have been ascribed to them. 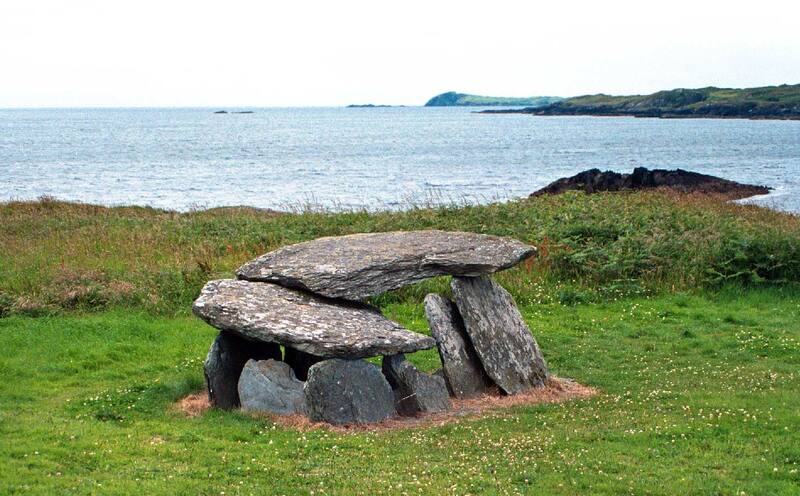 According to Carleton Jones, the megalithic tombs of Ireland can be understood as “machines for indoctrinating,” designed to influence the concepts of space and time. 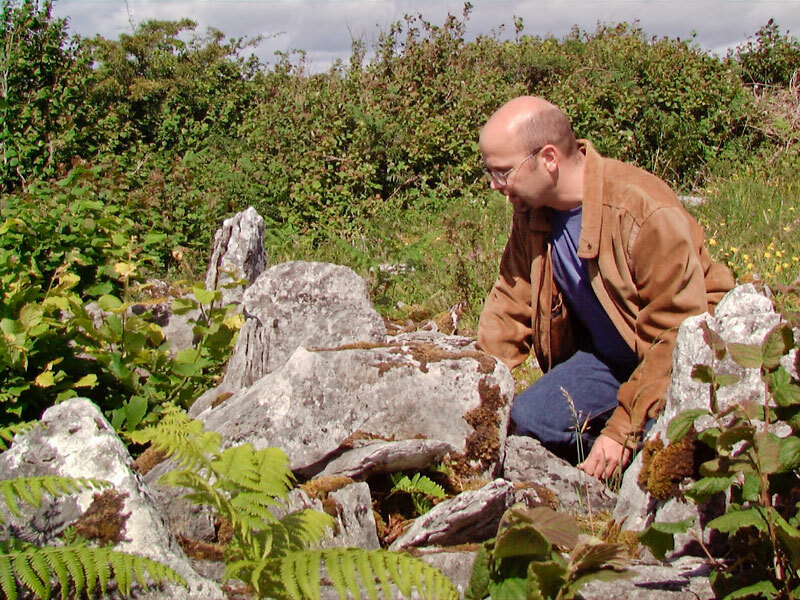 While there were surely many others destroyed through the millennia, there are some 1,600 megalithic tombs remaining in Ireland. They were all constructed between about 4000 BC and 2000 BC. While it is impossible to place ourselves into the minds of the ancestors who created these monuments, evolutionary biologists tell us that our minds have changed hardly at all in the past five thousand years. 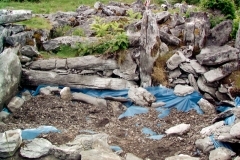 By seeking to understand the structures built by the people of Ireland’s late Stone Age we have an opportunity to understand these long-deceased builders themselves.3 Since the Irish (and the British) were pre-literate societies until the tide of Roman (and Christian) culture swept through in the first century CE, they have left us no written records. Thus their stone monuments, as interpreted by the science of archaeology, are an important means of understanding these individuals and their societies. 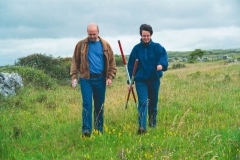 Click for a virtual-reality view of Carleton Jones and Alix Gilmer at their Roughan Hill Court Tomb excavation site in 1998. There were many more ancient manuscripts tragically lost, burnt by the authorities during the Reformation, than the few that were saved. But from the ancient stories that survived, the first concentrated focus on the prehistoric monuments of the country emerges. 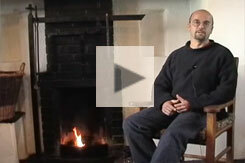 Archaeologist Carleton Jones describes his excavations at Roughan Hill (1998). 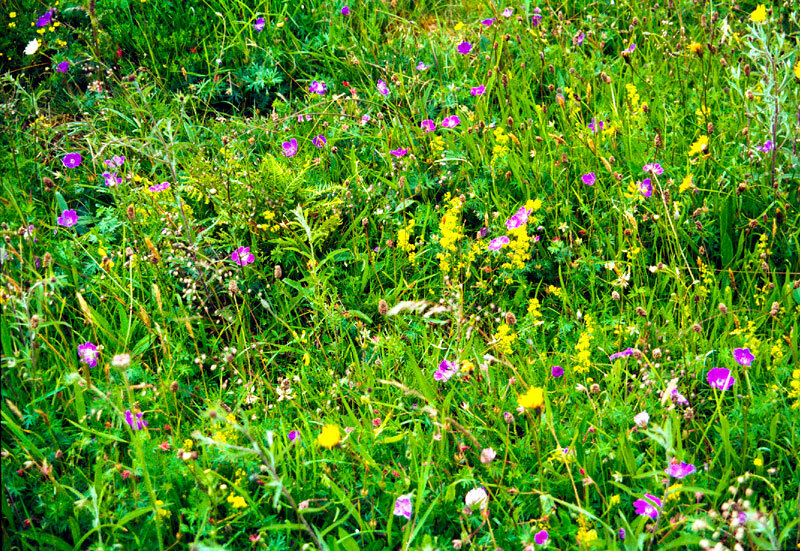 A reliance upon the Bible and the Roman geographers for historical information necessarily required that the ancient peoples of Ireland be traced back to either the sons of Noah, or to the nations identified by classical sources as the Caltae, Scythe, or Hyperboreans.21 But in the nineteenth century it became clear to many that human beings originated much earlier than the date of 4004 BCE derived from Biblical chronologies by Irish Archbishop James Ussher in 1650.22 Just a few decades afterward John Aubrey proposed that the megalithic monuments of England and Ireland were much older than most had thought possible, pre-dating the Romans in England and the Vikings in Ireland.23 Until Aubrey’s revelation, most scholars of his time were of the opinion that the ancient inhabitants of Ireland and Britain had neither the skills nor the community organization necessary to construct something as architecturally advanced as a megalithic tomb. The decade 1833 to 1844 saw the most significant enterprise yet in the study of Irish archaeology. Working for the Irish Ordnance Survey, George Petrie and his team, including scholars John O’Donovan and Eugene O’Curry, created an exhaustive study of monuments and the folklore attached to them. Unfortunately, Petrie’s attention to detail was a bit too exhaustive for those who controlled the government purse, and the first volume, on Co. Derry (1839), was also the last.25 Petrie’s later book (1845) on Ireland’s Round Towers set to rest the wide-ranging speculations regarding their supposed pre-Christian origin. 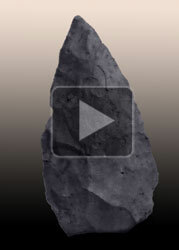 Click and then drag within the window to rotate this arrowhead found during the Roughan Hill excavations. 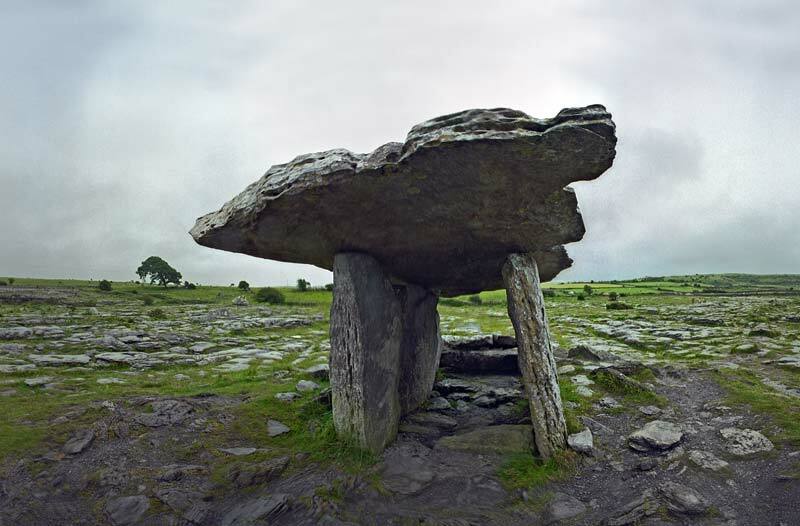 The megalithic monuments of Ireland are usually categorized by architectural style into court tombs, portal tombs, passage tombs, and wedge tombs. 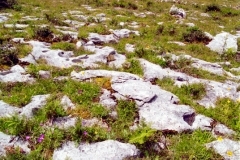 Other megalithic monuments, some also connected with burial rituals, include standing stones and stone circles. 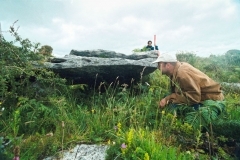 Some of the megalithic tombs may not conform completely to a single category, since through the millennia a monument may have undergone transformations by different generations who each used it for their own purposes.29 These monuments, built of large stones, required teams of community members working together in an organized fashion. Since many more people were required to build a tomb than could possibly be buried within it, only some, presumably important individuals, were allotted burial spaces. While the stones used in the tomb construction were rough and unworked, their positioning was carefully considered, usually with an alignment to the rising or setting sun on a particular day of the year. The court tombs, the portal tombs, and the early small passage tombs all began appearing in the Early to Middle Neolithic periods (c. 4000-3500 BCE). 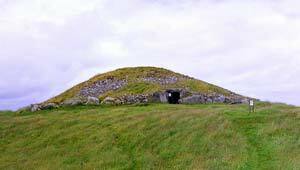 The largest passage tombs, built in the Late Neolithic, were followed by the construction of wedge tombs, which continued into the Bronze Age. These tombs consisted of a long stone cairn, with the semi-circular arms of a “court” leading out from the wider end. 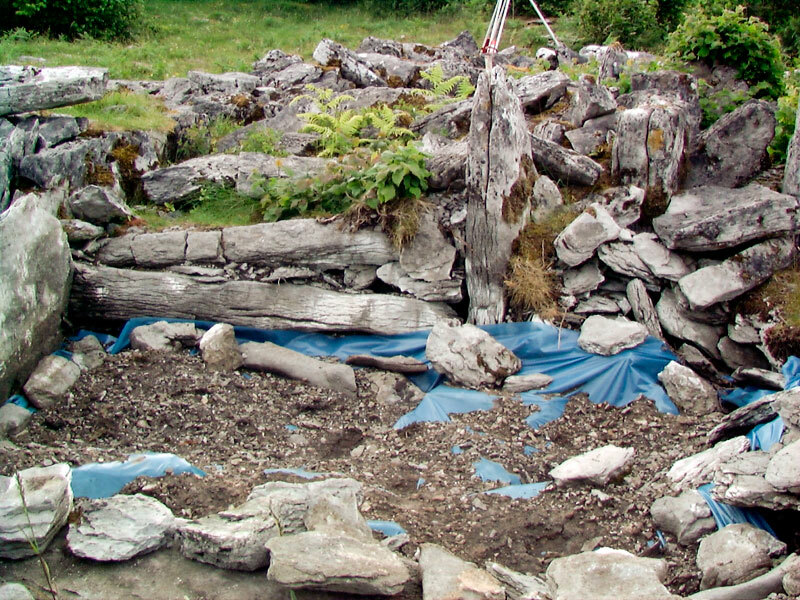 Deerpark Court Tomb, in Co. Sligo, is one example (left). 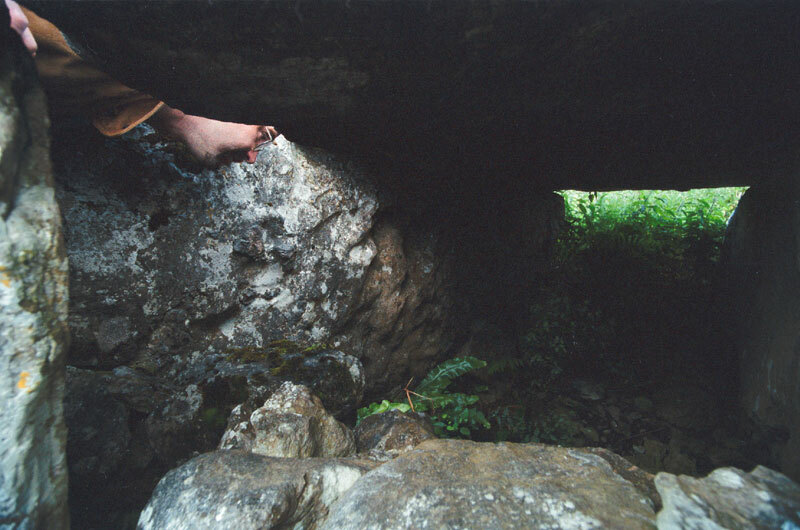 The cairn’s entrance led to a stone chamber containing the burial(s). Ireland has some 400 of these, most in the northern third of the island.32 While other types of Irish megalithic monuments also occur in Britain, on the Continent, and elsewhere around the globe, court tombs are found only in Ireland. The axis of the tomb generally runs west to east, with the opening to the burial chamber facing east. It is presumed that the court was where rituals were held during the burial activity or in later commemorative practices. Some examples have two forecourts, at opposite ends of a long cairn, with each court leading to its own burial chambers.33 The chambers of court tombs contained either buried or cremated remains, along with pottery, animal bones, and stone tools. Over the millennia most court tombs have been pilfered for their mounds of stone, so that only the supporting side stones remain. In the centuries after 3000 BCE, however, some tribes abandoned and sealed off their court tombs, turning away from the religion of their ancestors.35 Other court tombs may have continued to be used for ritual observances for centuries afterwards. 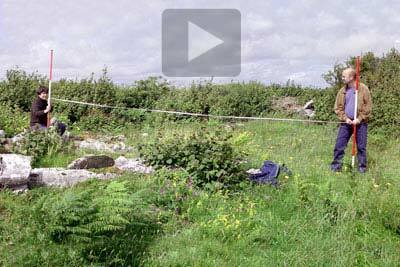 The last of the megalithic tombs constructed in Ireland were the wedge tombs, with a burial chamber that becomes lower and narrower toward the closed end. Co. Cork’s Altar Wedge Tomb is a good example (left). These tombs date from the later Neolithic to the Bronze Age, a time frame also known as the Beaker Period.39 They are often found on slopes that may have allowed the deceased ancestors to look down upon the homes of their descendants. Some wedge tombs have an antechamber that is closed off from the main chamber of a “septal” blocking stone. Like the earlier tombs, they held in addition to cremations grave goods such as pottery, stone tools, and even an early bronze axe. 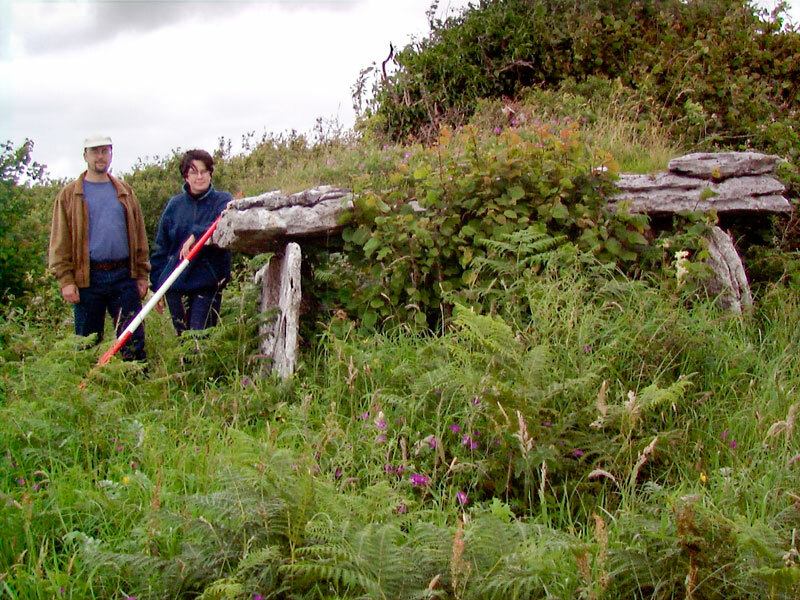 The wedge tombs are more commonly found in the west of the country, perhaps because by the late Bronze Age the now well-organized societies were developing social and economic relationships within their Atlantic maritime connections. Other megalithic monuments, namely stone circles, standing stones, and stone alignments were not usually built to house the ashes of the dead. 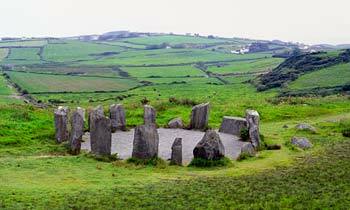 Drombeg Stone Circle, in Co. Cork, is one example (right). 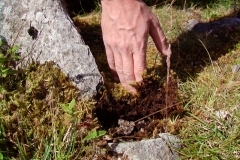 Stone circles and alignments are thought to have ritual significance, perhaps connected to celestial events. Glyn Daniel postulated that the circles evolved from natural clearings in the forest, which were symbolically supplanted by a ring of wooden posts, and then by an enclosure of stones.40 These stone circles, actually a ring of standing stones with their broad sides facing the center of the ring, were first constructed in the late Neolithic, and continued being built into the middle Bronze Age. Solitary standing stones, which may have been monuments to the deceased, alignments to natural landscape features, or even boundary markers, are thought to date from the Late Neolithic to the Iron Age (c. 2400 BCE to 500 CE). 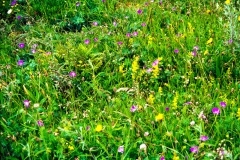 They may be as short as half a meter (20 in) or as tall as six meters (20 ft). Many of the Iron Age examples were dedicated to specific individuals with the carved characters of ogham text.41 A few late Iron Age stones have extensive decoration in the La Tène style. Long after the cultures that built them disappeared, long after the purposes for which they were constructed faded from memory, the Irish megalithic monuments remained prominent on the landscape. They continued on the ground and in the consciousness of the people as “ancient and powerful places.”43 The way that a monument may be been re-used could have depended upon its location, the way in which its shape lent itself to a later belief system, or other factors. 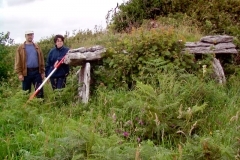 There is little evidence of the direct Christianization and re-use of megalithic and other pagan monuments by the early Church.44 Some monuments, such as the Carnfree mound at Rathcroghan, were absorbed into kingship rituals in the historic period. Some authors have reported that stone circles were also used for the “coronation of kings and princes,”45 although the evidence is unclear. Many became firmly associated with legends unrelated to the sepulchral purposes of their creators, such as the Diarmuid and Gráinne tales told of the portal tombs, or the many monuments said to be protected by the fairies. 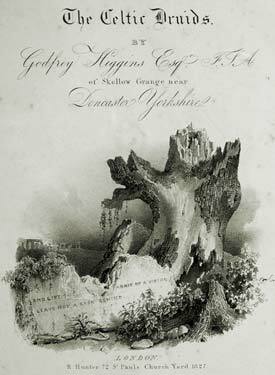 Higgins, Godfrey. “The Celtic Druids.” London: R. Hunter, 1827. 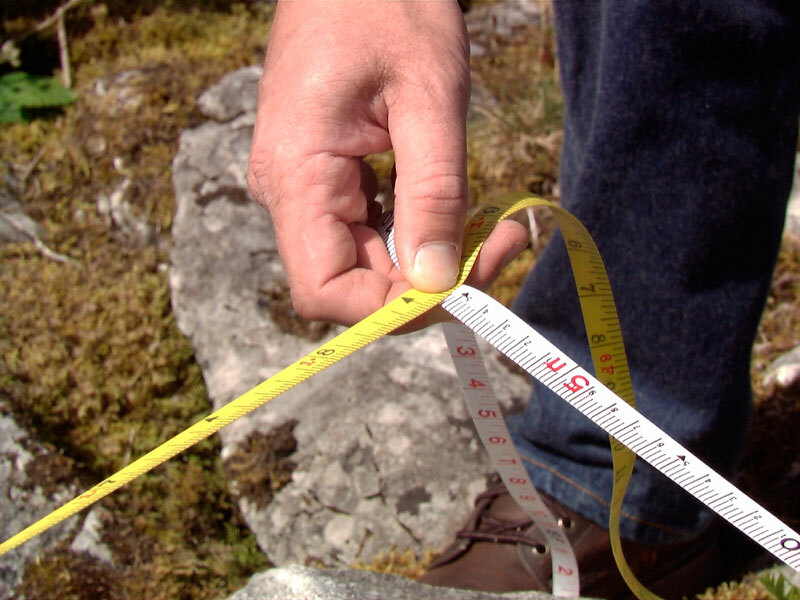 No age has seen a lack of those willing to put forth theories regarding the meaning of Ireland’s ancient monuments. In each generation some have used the monuments as a looking glass to reflect their own aspirations and spiritual identities. 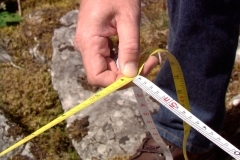 Some have developed theories regarding “ley lines” or other alignments connecting monuments one to another. Others have sought to ascribe their construction to the Druids or to “ancient astronauts.” Some have even worked to re-create ancient structures as follies or garden ornaments.48 It is clear that the very survival of a stone monument for several thousands of years does in itself lend the stones a powerful presence. 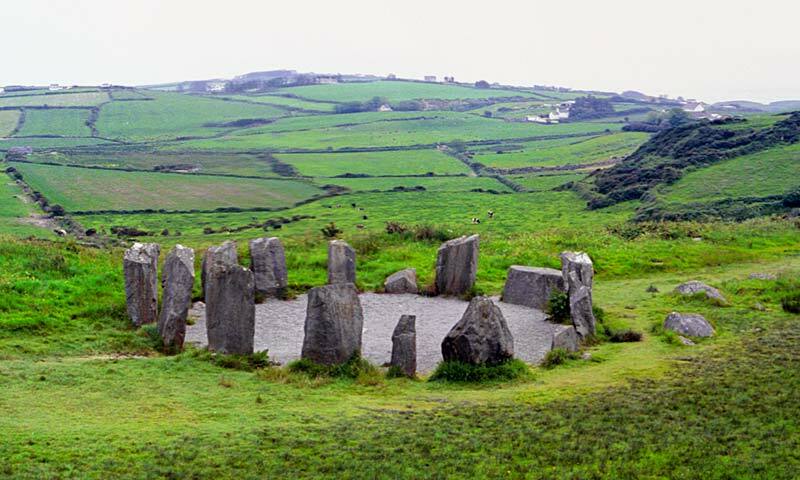 The lack of any documented history regarding the monuments or their builders have “attracted the fantast to whom the stones offered visions untrammelled by facts.” Books such as The Celtic Druids (left) did much to create interest in Ireland’s megalithic monuments.